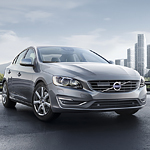 The Volvo S60 is a great compact sedan with a lot to offer for audio and technology. At Fields Volvo of Waukesha, we’ll show you why you want this car to drive around town. The brand has spared no expense to give you the very best. When you want an impressive sound system, the Volvo S60 doesn’t disappoint. A Harman Kardon system is standard, offering 10 speakers and an Air Subwoofer that offers incredible bass. Should you want even more enhanced sound, you can opt to upgrade to the Bowers & Wilkins premium sound system with 15 speakers and 1100 W output. As for the technology in this popular luxury sedan, it will offer a significant amount of convenience. A large touchscreen serves as your command center. You can have voice controls for your navigation, contacts, and music with smartphone integration. Plus, you can enjoy a number of safety features.